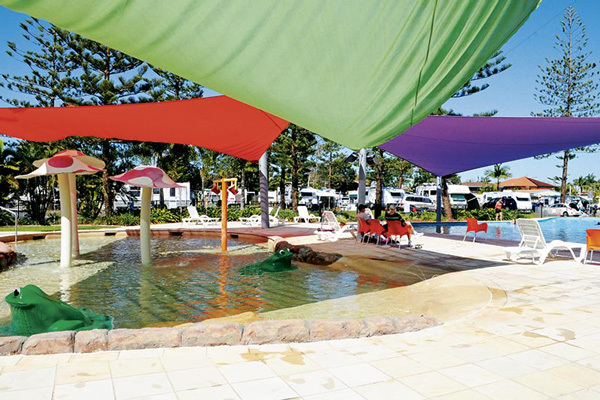 The Gold Coast is an exciting destination for families because of its many theme parks, children’s attractions and glitzy high-rise living, but much less so for many caravanning couples for the very same reasons. However, just 15 minutes south of Surfers Paradise and halfway to Coolangatta by the Gold Coast Highway lies Burleigh Heads and a very different Gold Coast experience. Then there’s the Burleigh Heads shopping precinct, encapsulated in a grid centred on James Street, with its many restaurants, coffee shops and boutiques, not to mention two of the Gold Coast’s best restaurants right on the waterfront. Add in great walks along the seafront or the national park on the Burleigh Headland, the excellent Farmers’ and Foreshore weekend markets, and low-cost meals with the best views of the coast from the local lifesaving club balcony, and you get the picture. Burleigh is beautiful! Today it is home to around 10,000 people, including many young families, while its world-famous surf attracts board riders from around Australia. The Quiksilver Pro, one of the world’s top surfing events, is often contested at Burleigh Heads when the surf is not contestable at Kirra or Snapper Rocks further south. But you don’t have to even taste the briny to ‘get’ Burleigh. The town’s beaches are lined with beautiful parkland, with picnic and free gas barbecue areas for everyone to enjoy. You can even pre-book one for a special event or celebration, as many locals do. The Fish House, just metres from the beach and almost next door to the Burleigh Beach Tourist Park is, in my opinion, not just the Gold Coast’s best seafood restaurant, but arguably Australia’s – delivering just the right blend of fresh, perfectly cooked and served food, and discrete, efficient service. Opposite, Oskars on Burleigh has an even better view of the beach all the way north to Surfers Paradise. 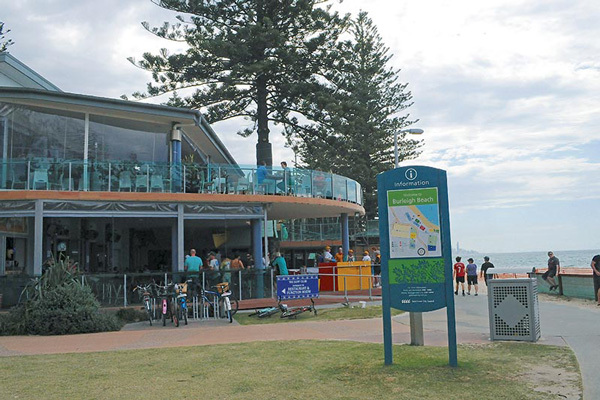 We enjoyed a lazy pub-style lunch on the balcony of the Burleigh Heads Surf Club, with an equally captivating sea view. 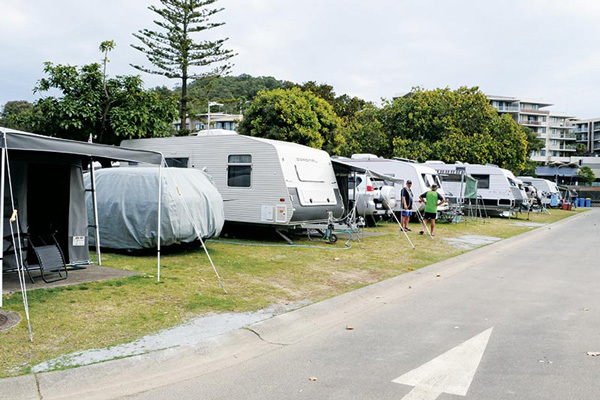 Burleigh has plenty of accommodation options, but let’s stick with the caravan parks. 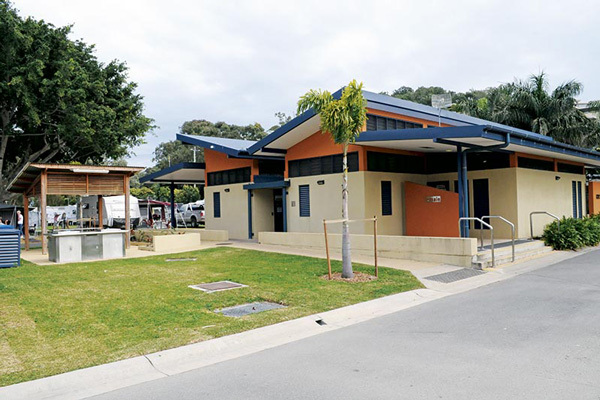 The two closest to the heart of Burleigh – both owned by the Gold Coast Council but managed independently – offer very different visiting experiences. 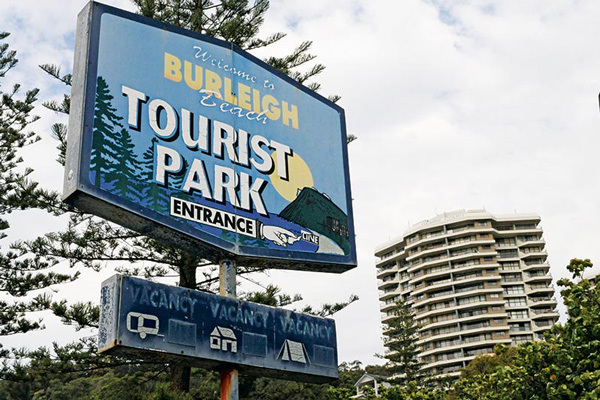 When it comes to location, the Burleigh Beach Tourist Park, just 150m from the main Burleigh Heads patrolled surf beach and five minutes’ walk to the Burleigh Village with all its shops, cafes and services, is on pole position. 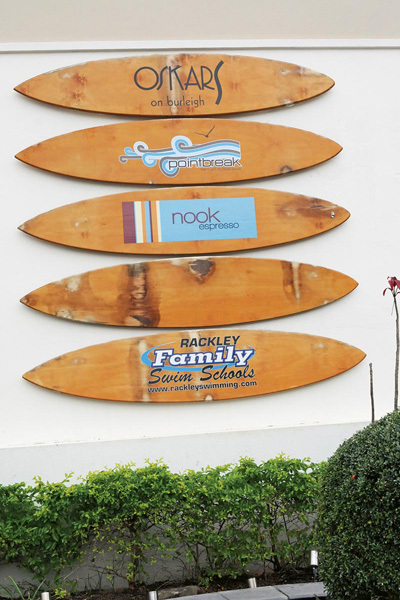 It’s also next door to The Fish House restaurant, opposite Oskars and across the road from the pub, the bowling club and the surf club, so you can enjoy a great night out at different price levels and walk home. Despite being sandwiched in a wedge between the Gold Coast Highway and the beach and overlooked by a number of multi-storey apartment buildings, the park is not particularly noisy – certainly not if you have a site closer to the beach rather than on the rear boundary. But as the sun rises before 5am in usually sunny, daylight saving-free Queensland, life for most people starts around 6am (the Coffee Nook opposite starts serving at 5.30am! ), so it’s something you need to adjust to. The park’s facilities have been completely upgraded, so you’ll enjoy modern and clean convenience blocks, with a laundry, camp kitchen, recreation room, outdoor barbecues, while the park also has a toilet dump point. However, there’s no pool or children’s playground, but both are virtually at your doorstep on the beach across the road, or on the nearby foreshore. 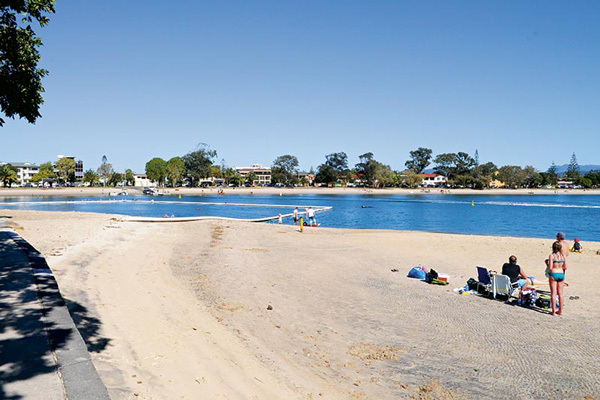 In contrast, the much larger and beautifully maintained Tallebudgera Creek Tourist Park, just over the Tallebudgera Estuary on the other side of the Burleigh Headland and National Park, en route to the airport, is more geared to family holidays. 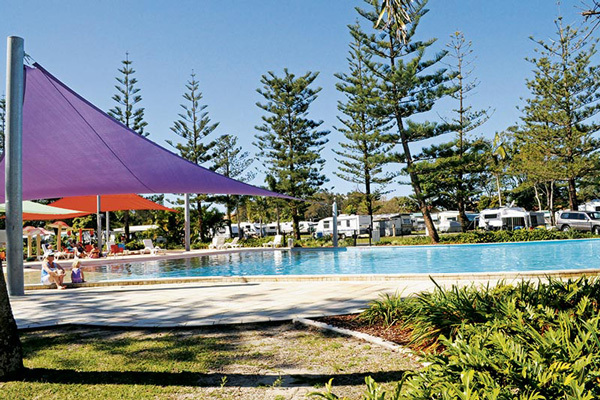 The park sits on the waterfront of the Tallebudgera Estuary, making it an ideal base for a water-based holiday, whether swimming, fishing, boating, waterskiing, windsurfing, or canoeing. For those who prefer the waves, the park is just across the road from the Tallebudgera surf beach and also a short stroll to Burleigh Heads National Park, with its scenic walks and lush rainforest to explore. 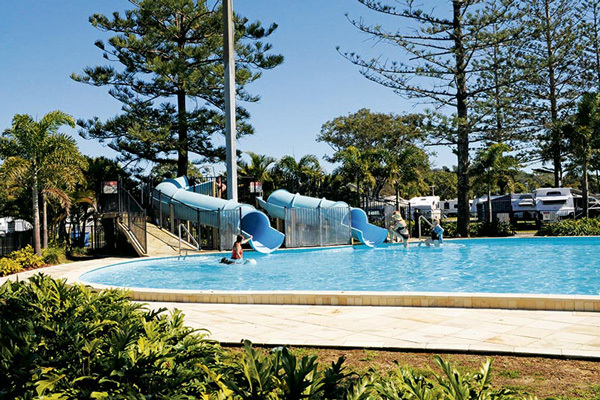 One of the main attractions of the ‘Tally’ park is its large, central, fenced and shady swimming pool, which consists of a resort pool, a lap pool and a children’s wading pool and during the day you’ll see many parents relaxing and chatting while their children enjoy a safe splash a few metres away. The park is also rich in facilities, including two amenities blocks with laundries, a camp kitchen, tennis court and playground. Both these parks are extremely popular so it’s worth booking ahead. And if both parks are booked out at the time you plan to travel, there are plenty of other options slightly further afield. 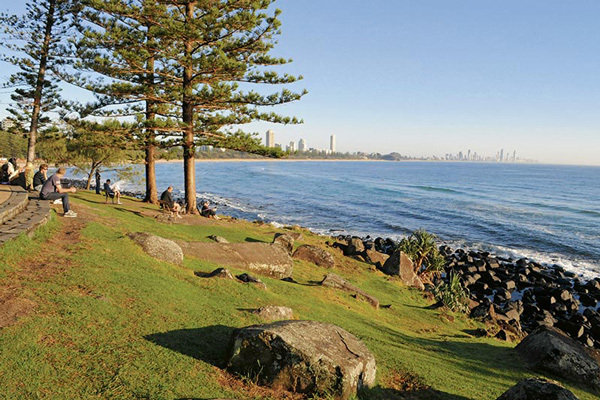 Burleigh Heads is located on the Gold Coast Highway, 15km north of Coolangatta at the southern tip of Queensland’s Gold Coast. It is approximately 90km south of Brisbane via the Pacific Motorway and 837km north of Sydney via the Pacific Highway. A full range of beach and surfing activities, bushwalking, fitness activities, lawn bowling, shopping, dining, and relaxing.